Representatives from Canada and the U.S. continue to work to devise an alternative deal to NAFTA. However, Canadian trade negotiator Chrystia Freeland said Friday that "we're not there yet." Stocks hit session lows after a report published off-record comments made by Trump concerning any future pact with Canada: "it's going to be so insulting they're not going to be able to make a deal." The Dow and the S&P 500 finished August up 2.1 percent and 3 percent, with their best performances for the month since 2014. The Nasdaq Composite clinched its best August since 2000, ending the month up over 5.7 percent. U.S. stocks dropped Friday as the United States and Canada put off resolving their trade dispute. Several indexes closed with historic highs for the month of August, as both the Nasdaq Composite and the S&P 500 notched all-time highs this week. Despite the trade troubles, both the Nasdaq and the S&P got a boost from tech stocks, with a 5.6 percent weekly rally in Amazon and a 5.3 percent weekly gain in Apple carrying the indexes to new records. Friday marks the U.S.-imposed deadline for a new trade deal to be secured between the U.S. and Canada. The latter country's trade negotiator Chrystia Freeland was expected to make a statement at 4:30 p.m. ET. on Friday after talks ended for the day. An administration official said they are expected to continue next week. Representatives from the Canadian and U.S. governments worked deep into the night Thursday to devise an alternative to the trade agreement. By late Friday morning, Canadian trade negotiator Chrystia Freeland said that "we're not there yet." The talks were reportedly upset Friday morning after the Toronto Star published leaked comments President Donald Trump made off the record to Bloomberg News on Thursday. The president said in these leaked comments that he is not making any compromises in the talks with Canada but that he has been unable to say so publicly because "it's going to be so insulting they're not going to be able to make a deal," the Canadian newspaper reported. Stocks hit session lows following the news. "What's affecting the market is that we haven't seen any good news out of the Canadian negotiations yet. Coming in today we had a higher level of confidence we'd see something accomplished and that seems to be dissipating with a plethora of news stories," said Art Hogan, B. Riley FBR chief market strategist. The U.S. dollar strengthened 0.7 percent against the Canadian dollar. Trade concerns continued to weigh on investor sentiment this week following a report that the Trump administration remains committed to imposing tariffs on an additional $200 billion worth of Chinese goods as soon as next week. Trump appeared to confirm the Bloomberg News report later Thursday, adding that he may remove the U.S. from the World Trade Organization (WTO). Trade-sensitive stocks such as Boeing and Caterpillar hit their session lows Thursday following the report. Shares of Boeing and Caterpillar dropped 0.9 percent and 2 percent in the prior session, respectively. 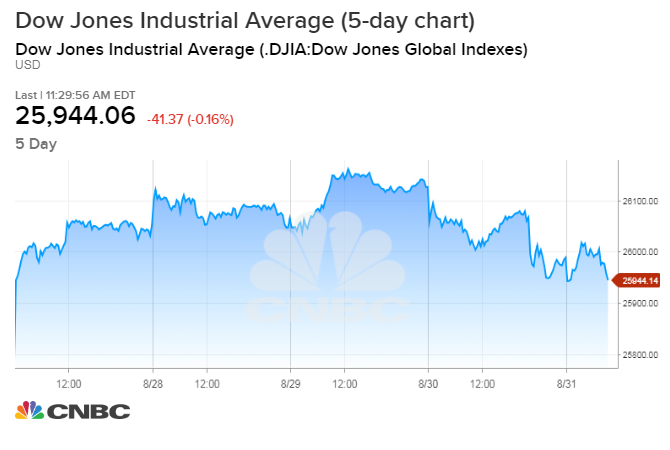 "We had the headline news on the tariffs, which knocked some things around, but we'll see how the day plays out as people start going away" for the weekend, said Jeremy Klein, chief market strategist at FBN Securities. "In September, it's going to come down to how the economy's doing: Are companies still confident in their ability to put up the big numbers?" FBN's Klein added. Markets will be closed Monday, Sept. 3 for the Labor Day holiday. Consumer sentiment in the United States rose slightly in August, beating economist expectations for a slight decline. The University of Michigan's month;y survey of consumers hit 96.2 in the final reading of August, better than the drop to 95.5 expected by economists polled by Reuters. Shares of Coca-Cola fell nearly 1 percent Friday after the company said it agreed to buy coffee chain Costa for $5.1 billion including debt to further its venture into healthier drink options. The move, which pits Coca-Cola against established coffee options at Starbucks and Nestle, will add Costa's almost 4,000 outlets to the world's largest soda company.